Beschreibung: Winds and radiation from massive hot stars in the Rosette Nebula have cleared the natal gas and dust from the center of the nearby star-forming region. They also pose a danger to planet forming disks around young, cooler stars in the neighborhood. 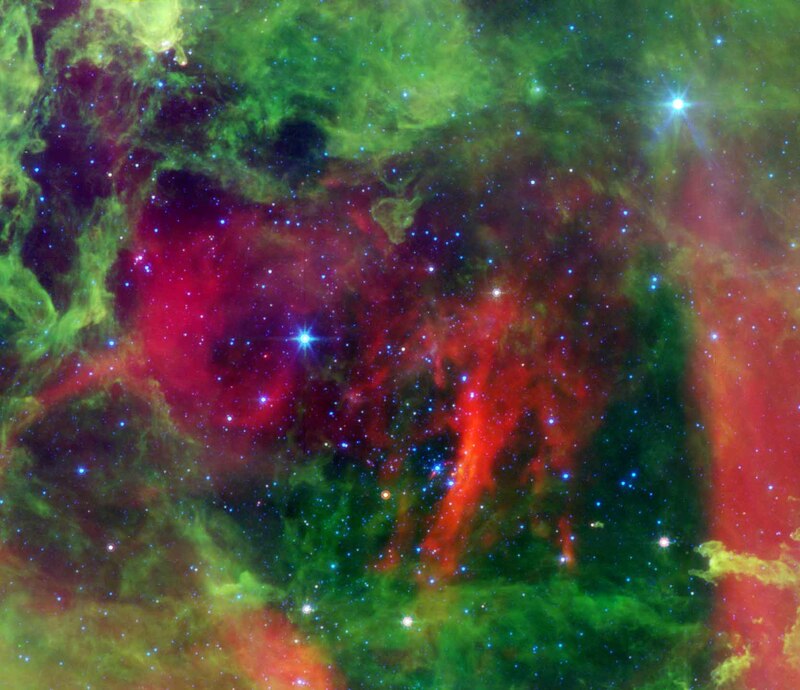 This Spitzer Space Telescope infrared image of dust clouds near the Rosette's central region, shows the cleared-out cavity. The view spans about 45 light-years at the the nebula's estimated distance of 5,200 light-years. Putting your cursor over the false color picture will highlight the dangerous hot stars, classified as O stars with surface temperatures of 25,000 kelvins or higher. Astronomers calculate that cool stars wandering within about 1.6 light-years of the Rosette's O stars are in danger of having their planet forming disks destroyed.